The people of Ledegem still treasure their freedom and commemorated their liberation, long ago in those dark days of WW1, by holding a special commemoration day on Sunday 12 October 2008. That day they remembered the allied soldiers who fought and died and the local inhabitants who whilst resisting the occupying forces, paid the ultimate price, so that Ledegem could be free. It is perhaps sobering to consider that Ledegem (Known as Ledeghem during WW1) is a mere 6.6 miles from Passendale (Passchendaele), the scene of so much WW1 carnage. Historians the world over will remember the Battles of Passendale of 1917 and much has been written about other offensives in Flanders during 1918, places such as Givenchy, Messines, Hazebrouck, Balleul, Kemmel and Béthune in April are the stuff of legends; the advances in August and final battle of Ypres that started the advance eastward our of Ypres. Then at the end of September the advance stops whilst supply lines are built and reinforcements put in place for the last big event in Flanders prior to the Armistice, the Battle of Courtrai. Furthermore whilst the earlier advances had been made of land destroyed by continual shelling, the Second Army were now advancing across terrain that had not previously been decimated by shelling. This was a time when small towns were still being lived in by the local Belgian population, albeit under occupation and control of the German army. Allied troops had to deal with civilians as they advanced across country and through villages and towns, War Diaries talk about the change in tactics because there were buildings and farms that had to be cleared. The German forces had used some of these buildings to camouflage the positions of bunkers, gun emplacements and machine gun posts. It was into this area that forces, such as the 2/Leinsters, were brought into action and it is to their credit that in pushing back the German front line, the community of Ledegem was not destroyed. Fighting building to building was not without cost in terms of wounded and dead of the regiments. In addition some civilians were killed in retribution by the German occupying forces. 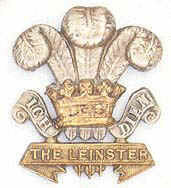 There was fighting taking place both north and south of Ledegem, which involved the 9th & the 36th Divisions. Fighting took place all around Ledegem, in the farms and small collections of houses. Altogether around 130 men died as a result of the action around Ledegem that day with an estimated 300 men severely wounded. It was perhaps understandable that Ledegem would become a safe place for the wounded especially as the Germans had already used the school, the church and the local hospital in Ledegem for this purpose. The 29th Division created a War cemetery in Ledegem and of the 1918 action there are 71 allied serviceman now buried in Ledeghem New Military Cemetery, eight of the 12/Royal Scots who died in the first attack on 1st October, plus 14 men from the 10th Hussars who fell in 1914 when the Germans first occupied the village on the 19 October 1914.